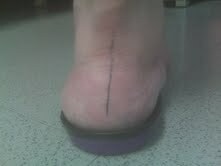 Here is a simple video demonstrating the checking on heel position done with patients routinely. This is especially important with Corrective Orthotic Devices when you are trying to change someone who inverts too much to a vertical heel position, or someone who pronates too much to a more vertical heel position. Here the Inverted Orthotic Technique of 35 degrees changes the resting heel position from 12 degrees everted to 7 degrees everted. 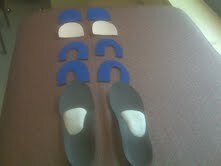 More orthotic correction therefore is needed to set the heel closer to vertical. A goniometer is used to measure the changes exactly. I just recommended this to a patient. If you have toenail fungus, and you are doing the various treatments listed in the below posts, or even anti-fungal oral meds, here is a product that allows you to polish your toenails. Even if it helps 10% I am for it. 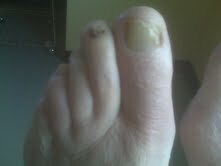 But, as you may know, one of the very important aspects of toenail fungus treatment is getting oxygen to the nail beds. 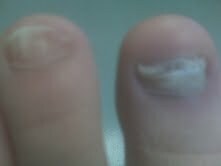 Toe nail polish will block the flow of oxygen, so use when you need to, and remove more often than you would otherwise. Margaret has right big toe joint pain. 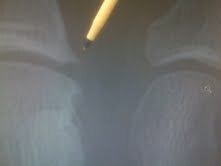 Her xrays which follow show slight peripheral bone irregularities classic for mild wear and tear arthritis. 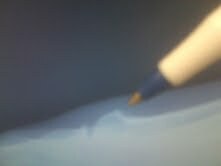 The pen points to the abnormal bone projections that can cause low grade pain and swelling in the joint on a chronic basis. 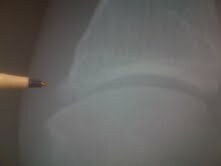 Bone projection noted on top of the joint. Bone projection noted on the side of the joint closest to the second toe. Bone projection noted on the outside border of the joint. These subtle wear and tear changes can lead to low grade irritation which makes the joint fragile. That sensitivity means that the joint can get inflammed and painful easier than another joint. When Margaret first came into the office the joint was so inflammed that physical therapy, icing, and spica taping was needed to cool it off. 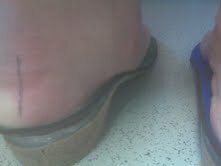 As she got back to normal activity, that sensitivity still made it impossible to wear fashionable shoes. After trying to have them stretched to no avail, she came back into the office today. Since the joint had great range of motion, and the pain seemed to be from pure pressure, 1/4 inch adhesive felt from http://www.mooremedical.com/ was used to off weight the sore area. Margaret intentionally did not place her foot above all the way into the shoe so that the photo could capture the placement of the padding. 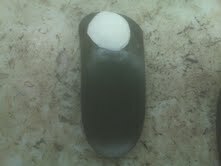 Even though 1/4 felt was used the patient could add or subtract easily from the overall thickness. Felt is very easy thin out. The padding is never placed over the sore area, only next to it. Care would be taken in most cases to trim or place so that is not obvious to others. Here was Margaret's email to me that afternoon (and she also got a medium gel toe separator to keep the big toe in alignment). Got the X-ray...got the toe spacers. The toe spacers are great and I think they are helping in addition to the felt! I am feeling much better! Keep me posted on the X-ray. Thank you so very much for your time! Thanks for the update on my X-ray. I do hope the terms "very little" stay "very little" and we can keep this arthritis from spreading. I will continue to "do the right thing" and add the spacers, tape, and padding to my routine along with the ice massages. In the meantime....if anything new comes up I will contact you. The 2 photos below show a 1/4 inch wedge placed into the heel midsole to re-level a shoe that is beginning to break down due to over supination (the motion of spraining your ankle). This can be accomplished by a local shoe repair shop although bring in the photos. Many of my patients are in great shoes, but they just do not have enough stability in this area. This rolling out motion of the heel is also called lateral instability. The shoe wedge gives a strong resistance to that motion. If done correctly, you should never feel like you then roll your feet inward (the opposite motion of over pronation). You want to resist supination, but not become a pronator. 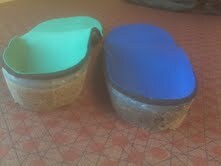 Today my patient Linda had a second pair of custom made orthotic devices dispensed. In the photo above, the newest pair with the spit polished leather is on the outside of the older pair. These 2 pairs are identical. Are they for pure luxury? No, Linda's situation is like many patients where her first pair of orthotic devices are doing very well, but not perfect. 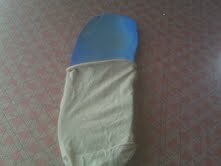 She still has some symptoms, but her function with the orthotic devices looks ideal. Does the practitioner experiment with an orthotic devices which are doing very well, and where the experimentation may ruin the orthotic device, or does he/she make a duplicate pair for experimentation? This new 2nd pair will be used for my multiple experiments to make good even better. I have had a low right shoulder for as long as I can remember but have only really had pain for the last 4 years, I am now 39. My first visit was to an orthopedic surgeon who gave me 3 injections of cortizone and prescribed 2 different physical therapists over a years time. I had no relief. I tried a recommended chiropractor but no relief. I finally got substantial relief from a neuro muscular massage threrapist. He got my muscles out of spasm and the pain subsided. He then also noticed that I was way out of alignment(hips going one way, spine going other way with low shoulder, neck going the other way and head then leaning the opposite way, a big zig zag all the way up.) By trial and error with foot lifts he found that when 10mm lifts were put under foot my left foot everything straightened out. This was good for about 9 mos. I had different pains as muscles adusted but all worked out except for a sharp hamstring pain that we could not get to subside. I then looked for help from my gp and he sent me to a new chiropractor, he determined that the hamstring was overworked because of the lift. He believes that my short leg is functional and with excericise and manipulation it will correct. After some time my hamstring subsided but now my shoulder dropped again and I am once again getting shoulder and neck pain. I don't know where to go next. Any advice would be greatly appreciated. I am from New Jersey and if you know of anyone in the New Jersey or New York City area I would be willing to travel to see them. George, Thank you for your patience with my answering this email due to my vacation. It sounds like the typical adult pattern of long right leg with dropped right shoulder. The short left leg would cause the head to lean to the left. The body deals with this by creating a scoliosis. The upper 1/2 of the spine brings the head back over the center thus dropping the shoulder of the side of the long leg. This seems plausible for you since the lift under your left foot did get rid of your shoulder pain. So, at initial glance, sounds like we need to get you back into your lift. Let's discuss why you got the hamstring pain that did not allow you to continue wearing the lift. I apologize for not asking you if the hamstring pain was on the right or left side or both. I am assumming it was on the side of the left lift. If not, let me know. When you use lifts to correct for a short leg, you can create some instability by lifting the foot out of the shoe (especially if only heel lifts were used for the lifts, or it the lifts were on very soft material). The hamstrings in this case work harder to stabilize the leg and can become painful. As you use lifts you may also straighten the knee some putting a stretch on the hamstrings (more stretch than what they are used to experiencing). If you add already tight hamstrings (like me), that extra stretch can be painful. The sciatic nerve off the back is can get painful as it runs through the hamstrings, and is often misdiagnosed as hamstring strain. The same treatment for sciatica (as it is called) is totally different than hamstring strain. The sciatic nerve could get irritated for multiple reasons, including using a lift inappropriately (say on the wrong side). So, as this is pieced together, and you can hopefully see it is detective work, you should be able to find a solution. As I have mentioned in my posts, when there is differing opinions on what side is short, and whether it is trully functional or structural or combination, I would get the Standing AP Pelvic Xray barefoot. You stand with the knees straight and feet in normal position. If one arch is alot flatter than the other, and you wear orthotics to correct that, you would want to wear shoes and orthotics. But, if your feet are fairly symmetrical, barefoot is perfect. That one xray will answer once and for all if you have a short leg, then treatment is not so much guess work. There is radiation with xrays, so docs try to avoid this xray unless forced into it. I think you should have the xray. Ask your GP to order for you. Every profession has biases. Podiatrists are biased certain ways. 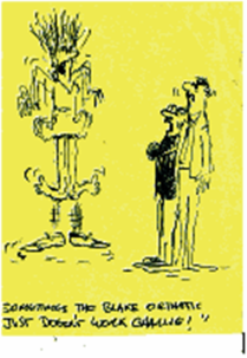 Chiropractors think most short legs are functional. Orthopedists generally feel that under 13 mm short legs do not cause much problems. GPs generally think lifts are a big pain to deal with so they don't even want to get started on short leg treatment. This is why the chronic pain syndromes caused by short legs can go on forever. I am hoping when you read this that you were just using heel lifts under the left side, and once you change to full length lifts (as described in various posts), your shoulder pain will again disappear and your hamstrings will remain calm. That is actually what I would do if you were sitting in my office right now. If that did not help, I would get the xrays (although I would also do the standing LLD exam that my blog even has videos on). Has anyone done the standing LLD measurements outlined by my blog? Was your hamstring pain on the left or right? Were your lifts in the heel only or were they full length (at least going to the toes)? Did the doctor who was the most helpful feel that the shoulder pain was coming from your neck? Did they try to differentiate the hamstring pain from possible sciatica? I have LLD. 6mm short on the right side. I purchased custom orthodics 3 months ago with a 3mm heal lift (1mm hard material and 2mm compressable material). I am uncertain whether my pelvis is in alignment and whether the 3mm lift is the correct height. I have been experimenting with adding another 2mm lift but my right hip is beginning to hurt. I don't know whether I need a 6 mm lift or if the 3mm lift is sufficent. Any general recommendations with lift height vs LLD discrepancy? Dear Josh, I wanted to publish this email directly since there are so many key rules. Most of the information is spread throughout some of my earlier posts, but this is a good place to summarize my thoughts. 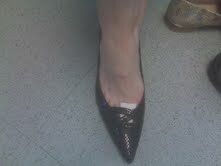 Point #1: Do not have the heel lifts attached to the orthotic devices. They should remain separate for separate experimentation of what causes pain, and what produces the best stability. Also, some shoes can only take a certain extra lift height, whereas another shoe could take more. So, see if the practitioner can take off the lift on the orthotic (you can also use a local shoe repair shop). Point #2: Try to stay away from heel lifts as lifts for short legs. Use full length lifts whenever possible. 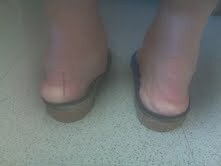 Heel lifts add more ankle instability and possibly more heel impact shock than full length lifts. Your hip pain can be do to heel lift instability more than the actual height. Point #3: If you are using lifts for a purpose, and there is room in the shoe (most athletic shoes take up to 9 mm), why would you not use the full correction. You are 6 mm so I would use 6 mm full length lifts (usually 2 one-eigth inch lifts suffice). Point #4: When you use full length lifts for a short leg, patients get enough biofeedback from their bodies as they walk and run to know when they are at the right amount. So, listen to your body, what is it telling you. 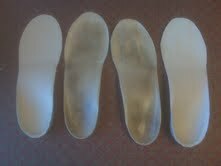 When you walk with just the orthotic devices (see why we need them separate), do you feel uneven. When you put in 1/8th inch (3 mm), do you feel more even? When you go higher, do you feel better or worse? You must feel it or you are at the whim of generalizations someone (like me!!) is using. Listen to your body about what the lifts are doing. The person who measured you could have been wrong and it is the other leg that is short. i like your web presence, complete and clear. i had my right hip done, THR, and will be in to see you once things have settled and we can see if my orthotics need adjustment. but in the meantime, they are squeaking and driving me nuts. i've tried talcum powder, which i thought you said would do the job, but perhaps i remembered incorrectly because it did not work. any suggestions to quite my feet? A lady brought into the vet her dead duck. "Please doctor exam my duck and tell me it is not dead, it is my favorite duck." The vet tells it will be $25 to examine the duck. He examines the duck and confirms it is dead. The lady is hysterical and wants a 2nd Opinion. The doctor brings over a cat who also confirms the duck is dead. The lady again insists that the duck can not be dead and wants another opinion. The vet bring over a lab who after sniffing the duck confirms it is dead. The vet says that will be $175. The frustrated lady says why that much?? "Well, my exam was $25, the Cat Scan was $100 and the Lab fees were $50." I am a aerobic instructor (body pump, rpm and bodystep) and I have just had achilles tendon surgery (achilles tendon stretched over heel bone). It has been five weeks since my surgery, and I am now in a walking cast. I would like to know when it would be reasonable to go back to teaching. I realise I have months of physical theraphy ahead of me. Would it be possible to get back into teaching bodypump around 5 months post op? For any of my readers unfamiliar with body pump, here is a short you tube video which is good to watch before reading my response. Thank you so very much for your email. Even though I do not do this surgery, I have rehabed patients successfully back from the surgery for many years. This answer can get more refined as I learn from your physical therapist the state of your tendon's flexibility and strength (this can be emailed). I will assume you were very strong before surgery in your calves, so we must use the noninjured side as our comparison. In the 1970s you assumed the injured side would only get to 90% of the normal side in strength, but in 2011, with all the improvements of therapy, 110% is common in an athlete like you. Yes, you will get the injured side to 110% in strength since you want this never to happen again. First of all, strength gains can not be obtained with Bad Pain. So, please become an expert on Good Pain vs Bad Pain and live in the Good Pain realm. See the link to my post on Good and Bad Pain and memorize it. It is the only way to say reasonably objective, along with your physical therapist's and surgeon's guidance. When I watched the video on Body Pump, I realize that your classes may be more intense. As an instructor, it would be hard not to demonstrate, but some level of cheating on technique will occur. You must assume with surgery that the calf/achilles have stopped working and you have little to no strength. You are starting all over. With this surgery, regaining strength is key. Tone comes first, then gradually power, and then finally endurance. Power and endurance come slowly unforunately and our key to preventing re-injury. Typically, even in well trained athletes, the endurance strength takes 12 months to get to that 110% level, but you will need only 50-60% strength to start teaching protected. On average following injury, you lose 3-5% of your overall strength daily until you painlessly begin to restrengthen. At 5 weeks post surgery, not injury, if you do the math, we can assume your achilles and calf are like jello. So, you need to begin to strengthen now, and as painlessly as possible. This is not the time for No Pain No Gain. As you strengthen the calf/achilles, you will gain tone first, power second, and endurance third. You unfortunately gain much slower than you lost. Tone is gained, as long as you do not push through pain, at 1% per day at best. So, given a good strenghtening program, in 2 monthes you will have 60 % of you tone back. That will give you some protection for your achilles, probably along with a tightly wrapped ASO Ankle Brace, and you can start going back to class. The problem is that tone is gained 1% daily, power at 1/3% daily, and endurance 1/4% daily. These are rough but good generalizations. I have found that 80% of normal power is acceptable at achieving initial athletic goals. This will occur 240 days from now, or approximataely 9 monthes from surgery. This is when the average patient after achilles surgery begins a running program (with the range from 6 to 12 monthes). For teaching Body Pump Classes initially you will not need 80%, probably only 50% since most demonstrations can be done with both feet on the ground (like squats and upper extremity strengthening). You should hit 50% at 150 days or 5 monthes after surgery!! See how the math works. The real problem is at 5 monthes will be the lunges and any other forced weight bearing exercises on predominately on one leg. When doing a lunge, the back foot is in a heel non weightbearing/ suspended position (thus unstable and prone for too much chance of injury). Please see my previous post on Negative Heel Stretching which you should not do for several years post surgery, and explains the precarious position of the off weighted heel. A good physical therapist, and many trainors, will be able to help you improving in tone, power, and endurance over the next year. 5 monthes is the normal time to start back when you are at 50% power for Body Pump, but higher levels will take 80-90% (and this will not be achieved for 8 monthes or 240 days). Endurance just takes time, and is associated with painfree sport specific exercise (for me, I just have to go out and play basketball and build up my strength). For ACL repairs, Tommy John Surgery, Achilles Tendon Repairs, and a few other surgeries, the 2nd year is really the Endurance Year. That is when you feel like your old self again. It takes 4 to 12 monthes working out at a high level to regain your endurance back. The second year normally begins with you just starting or up to 2 monthes into a high level of activity. So, be kind to yourself the second year. Until you get back your endurance, your fatigue level is lower than you want, and pushing through fatigue is when injuries occur. Read over my post on types of strengthening exercises (see Question #18) and then you will have better conversations with your PTs/Trainors on tone/power/endurance. I want to close with two points. #1 strengthening above the calve is vital to building good strength back for athletic endeavors--quads, hams, core, esp. There is an indirect but powerful protective mechanism in strengthening above the injury. I believe it really pays huge dividends when you are in the endurance phase. And #2 see the post on the Power of 2 postitional toe raises. Once you are doing 2 sets of 25 one legged toe raises daily with ease you are at 80 % power. 1 set of 25 is around 50% power and when you are ready to start teaching Body Pump. I sure hope this helps. My patient Stephanie was in the other day with her sore metatarsals around the 3rd and 4th ( if you count the big toe as 1). After adding a Hapad support to her present orthotic devices, made by the great Dr Mario Rizzo here in San Francisco, and a good friend, I then proceeded to design other inserts to accommodate, cushion or both. By the time we had ended the visit, Stephanie had quite a collection and I could not pass up the photo op (All In the Name of the Blog!). But, I think it shows well the trial and error that must be done to see what works with these problems. Stephanie will experiment with one, two or three layers under each foot in the toe area. She understands what helps the right foot may be totally different on the left foot. When designing orthotic devices, the practitioner considers the symptoms, the patient's biomechanical makeup, and gait evaluation findings. The practitioner tells the lab by filling out an Rx sheet directly or indirectly how much support to give each of the 3 arches of your foot: medial (inside), lateral (outside), and metatarsal (ball of the foot). And this is tricky business. The biomechanist must compromise since many labs or products support these arches differently. If you look at the whole line of over the counter inserts, they vary immensely in how much they support each of these 3 arches. Among the various orthotic laboratories I have seen, the standard orthotic correction can vary for the same individual in these 3 arches. This is one reason podiatrists at least tend to stick to one laboratory since they get very familiar with their artistic flare. When you send an impression cast to a laboratory, you should know what it will look like when it comes back and whether it will do the job needed. This union between the practitioner and lab takes awhile. The Metatarsal Arch correction can be vital or not that important for each individual. Problems occur when the importance of the arch is not recognized. Most of the orthotic devices I see really have a poor to average metatarsal arch. I love the Your Sole OTC orthotic devices, but they have poor metatarsal arches and I should not use them when good metatarsal support is crucial. Hapad Arch Supports are all over my blog, and just support the metatarsal arch, ignoring the other 2 arches. I love Hapad company, their pads have a vital place in my practice when metatarsal support is needed. You can combine any orthotic with a Hapad metatarsal arch or Hapad Medial Longitudinal Arch (which I still use as a Metatarsal Arch). When podiatrists take impression casts, they are just capturing the skin impression of the arches. This is why it is not exact. When casts are taken weight bearing, these arches flatten out some, again not perfect. Someday I will understand the metatarsal arch better, and my help for my patients will improve immensely. 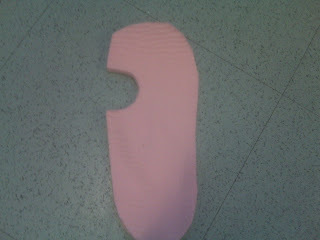 For now, this is the most arty aspect of an orthotic device. If you have orthotic devices which do not a noticeable metatarsal arch, and you have pain in your foot, or continue to feel unstable, ask your practitioner if they think any more metatarsal arch can be experimented with. Here is an additional metatarsal support being applied to a Good Feet Orthotic Device for metatarsal pain relief and stability. All three arches work together. By adding this metatarsal arch, the amount of foot pronation decreased. 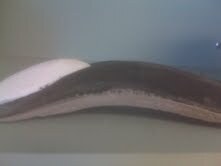 Here is the same Metatarsal Arch from the side view. On the Good Feet Orthotic Devices, it is common to have to add medial and lateral arch reinforcements for extra stability. 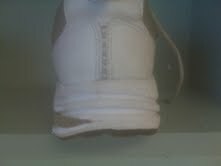 This photo above demonstrates that when you add topcovers try to initially just glue the heel area. It makes it so much easier if further adjustments to the metatarsal arch are needed. This was first brought to my attention by ProLab USA. Here is an example of a Spenco topcover before it is glued in place. It can make the pressure from the metatarsal pad more comfortable. 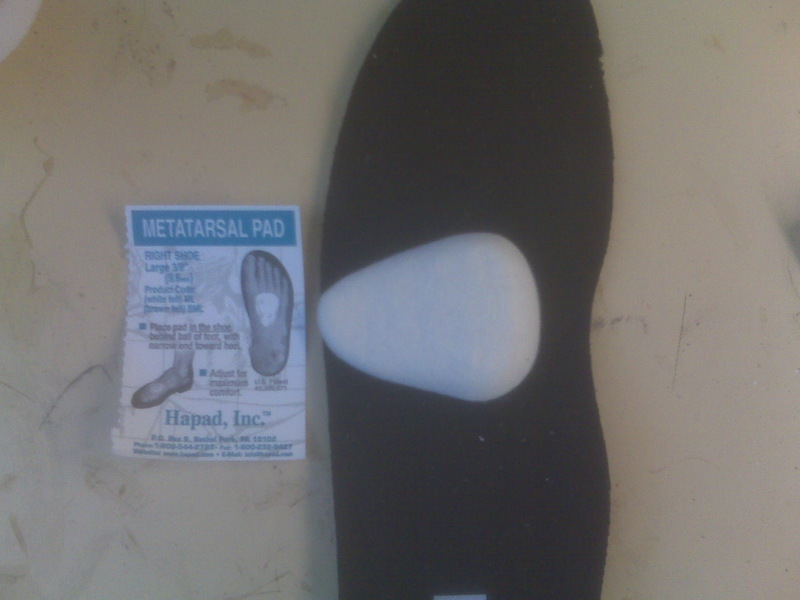 Here is the Hapad Metatarsal Pads. You need to move them around, turn them on their side (whatever works!! ), to find the best place for each foot. Each foot may require a different design/placement. Hapad Longitudinal Medial Arch Supports (normally, like the metatarsal arches, ordered small) can be shifted all the way to the outside border of the foot to work as a great metatarsal arch. This product can be used on an orthotic device or alone in a shoe or sandal. 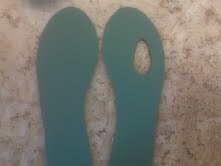 The photo below is of 2 left foot orthotic devices. The blue is set at 35 degrees Inverted. The green is set at 50 degrees Inverted with Medial Column Correction and Kirby Skive. Charles has left foot posterior tibial dysfunction and is trying to avoid further collapse of his foot and surgery (at least postpone the need for surgery). Besides these corrective orthotic devices, Charles is doing foot strengthening exercises daily, kinesio tapes his arch daily, wears supportive motion control shoes or light weight boots, and power laces his shoes. 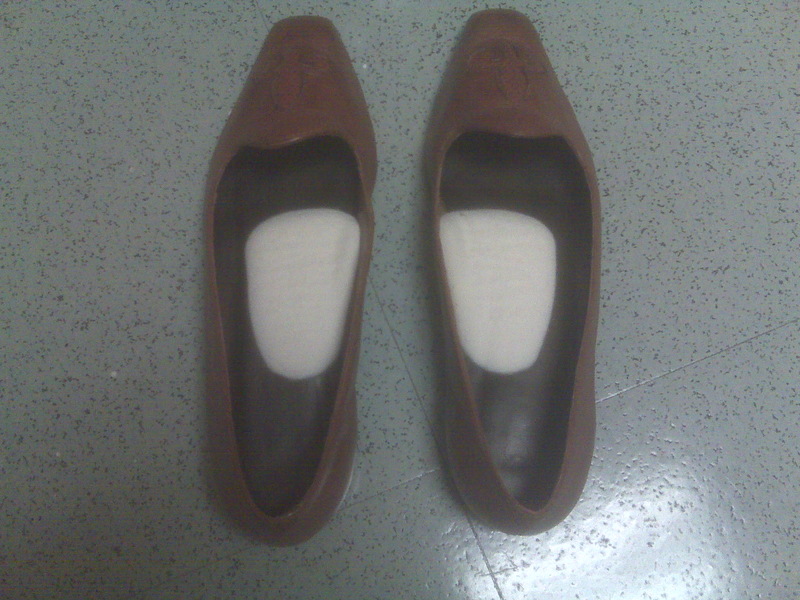 Charles relaxed heel position is 11 degrees everted on the left and 4 degrees everted on the right side. My initial correction was 35 degrees (a 7 degree varus cant) on the left and 20 degrees on the right (a 4 degree varus cant. 35 degrees is my standard highest correction to get patients used to such a change. His previous orthotic devices had changed his heel position to 9 degrees everted and 2 degrees everted, and they were hard and uncomfortable. My initial correction using a soft plastic of 5/32" polypropylene changed his heel position to 10 degrees everted on the left and vertical on the right. So I am brillant half the time!! The correction was just not enough to control his foot. The photo below again shows the difference in the two left orthotic devices, but I have put the medial arches side by side. The blue again is a 35 degree Inverted cant and the green is 50 degree Inverted Cant with higher than normal medial arch and Kirby Skive. In my twisted mind, pre dementia, the 50 degree Inverted position should give a 10 degree change normally, the medial arch correction 2 more degrees of change, and the Kirby Skive another 2 degrees of varus change. So what happened? When I measured Charles in his 50 degree Inverted left and 20 degree Inverted right, his resting heel position was 4 degrees everted left, and vertical right. So something positive is happening. I will give him 3 to 4 months to get used to, and then crank up the left again. Why? This is a big question. Even with the original left of 35 degrees, Charles felt very good. But, I can not lose sight of what we are trying to prevent. Surgery. With that at stake, I tend to go for perfect support more aggressively. The photo below of the left is the same as above. It is hard to see the exact 4 degree angle in this photo, but you can probably note the heel still pronating on the device and moving to the outside (lateral) part of the heel cup. 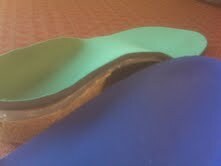 See how the better corrected right foot sits down well in the heel cup in the photo above. My heel cups for most Inverted Technique patients range from 21 mm to 27 mm, so they are deep adding to the control of the heel motion. 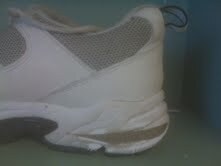 Below is a photo of Charles' left heel in his original orthotic device. Goniometer readings had this at 9 degrees everted. Here a goniometer with one arm along the floor and the other arm along the heel bisection is measuring that initial 9 degrees everted position. What you can not see is that orthotic was reinforced in the medial arch by the well meaning podiatrist to get more support. Any time you don't really control the everted position, and you remove the flexibility of the arch by arch fills for reinforcement, you run the risk of making a very uncomfortable orthosis. As was this one. 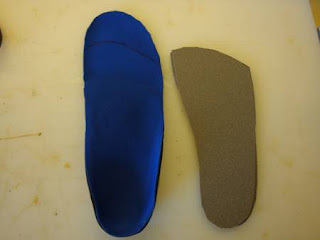 In conclusion, the inverted technique is used very successfully in these severe pronators. But, because of the posterior tibial weakness and the length of time the foot has been flat and the soft tissues have had time to contract, the exact degree changes can be unpredictable yet logical. I present Charles since his challenge comes to my office routinely and I will be working on his third left orthotic device in the near future. And I feel really proud of what I can do for him!! 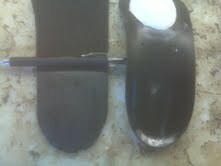 Above is a Spenco insert which has the area of soreness cut out on the right foot. You can mark the sore area with a felt pen or old lipstick on your foot. Then put your foot into the shoe and walk a few feet to see where the mark comes out. Cut an area just bigger than the mark. 2 layers may be appropriate. 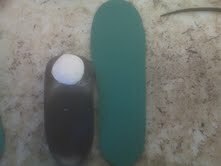 Here 1/8 th inch adhesive felt is being used to accommodate a sore big toe joint. Be creative with old shoe inserts that you are not using anymore. The CNN images of the terrible destruction in Japan today are haunting and soul wrenching. The world sits in awe at the power of this destructive force. Everyone is called to help and this is what I ask my readers. Below is a list via Yahoo News that can help you get started. From my last post on Robert as he presented with the classic gout vs infection decision making process, I decided to injection a low dose of cortisone into the big toe joint, and the other joint in the big toe (1/2 ml of Kenalog 10 with 1/2 ml of 0.5% Sensorcaine plain). He had not improved on 3 weeks of antibiotics from his primary. There was no reason he should be infected. Here again is the pre-shot photo. Following the shot, he felt improvement that night. When he returned to the office 5 days, 85-90% of his pain was gone. Here is a post injection photo. This sounds logical, but the fear of infection makes docs think about antibiotics first. So I am glad I got to the patient second!! 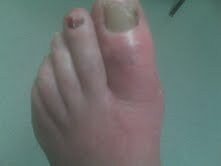 Robert presented with this swollen big toe 2 days ago. 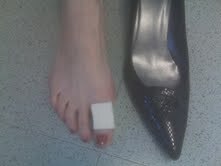 It came on suddenly, without incident, and initially was only in the big toe joint. The foot was red around the ball of the foot with the redness over the last 3 weeks spreading to his ankle. His pain is now throughout the big toe, but does not involve the toe nail itself. These presentations are either infection or gout, and there was no reason he should have an infection (no cuts in the skin, etc). His primary care doctor has placed him on 2 courses (10 days each) of antibiotics without relief. Unfortunately, if you have a gout attack, the uric acid crystals leave your blood stream and attack the involved joint, so the blood levels are temporarily within normal limits (but they still are high normal). I decided to place Robert in a post op shoe since he was walking around in his sock (can not take any pressure), and gave him 2 low dose cortisone shots into the 2 involved joints. He called me the next day saying that he was so much better, and actually slept for the first time all night in 2 weeks. Of course, you do not want to give cortisone into a joint that may be infected, but his history and exam did not point to anything but gout. I will check him next week. I also recommended icing 10 minutes 3 to 5 times a day to cool down the joint. I will get blood work in 3 weeks to see what his blood levels of uric acid are then. Below is the article from my son Chris published today in Business Insider about the release from jail of Plaxico Burress, an exciting former NFL receiver for the Super Bowl Champion New York Giants. I am so hopeful that Burress is now reformed, and can return to greatness, as I am hopeful for other players that have blown it . I hope he can be the role model our kids and grandkids need. I wish you well Plaxico Burress. I hope the system has worked for you. I hope you have a mentor to help this transition, as for everything in life, we need others desperately to guide us. Below Chris' article is a youtube video of Burress' touchdown catch from Eli Manning in the 2007 SuperBowl. I remember it as if it was yesterday. How is this relevant to a podiatry blog? Watch those feet move as Burress easily blows past the defender, true artistry of motion. But this story is part of the dark side of sports. This is the same side of the coin as negative addiction to sports, little league syndrome of parents like the Great Santini, the recent drug scandal of baseball and track & field. Like my video a few days ago about Jalen Joiner, let's find the joy of sports again collectively as players, coachs, parents, and spectators. Joy and great competition can go hand and hand, not mutually exclusive as some believe. I quit baseball after my junior year in college when the joy was gone. I play sports now because I enjoy them, not to win at all costs (although a few Ws are always nice). I try to always have my team mates backs, with great respect for the competition. Plaxico Burress, I hope you can find this healthy side again for you are truly a great athlete. A thesis on athletic performance could be written on these 3 short videos of my buddy, and basketball nemesis, Jalen Joiner. For 6 years I have battled Jalen in basketball, and for 6 years I have lost every single contest. Last year, losing 98 to 80, Jalen allowed me to score 18 straight points by not playing defense, only to beat me 100 to 98. Jalen is now playing Park and Rec and Boys Club ball and is known all around San Francisco for his defense and hustle. Perhaps, alittle of me has rubbed off, but more of Jalen has rubbed off on me. Jalen plays with pure joy, and loves the competition. I play with many adults that have lost that joy. Look into Jalen's eyes, mind, and heart as he goes for a feat that even 3 months ago was impossible. For all the adults, remember Jalen the next time you play any kind of sport. Take alittle of Jalen's spirit with you. Do you remember as a kid doing something so special like this? Do you remember how proud you were? It was usually your secret alone. I am glad I could capture one of Jalen's feats on tape. His spin moves around me however have always been a blur. Soon, even this special time with Jalen will be over for me for many reasons, and I am truly sad. But, I am glad I have competed against Jalen, and you are going down Jalen the next time we play!!!! The following video introduces a great product called a Roll A Bout. Maria demonstrated the ease of movement. This was the first day Maria used the Roll A Bout after struggling for 2 years with crutches to off weight her injured left ankle. The crutches eventually caused shoulder, elbow, and wrist pains, so Maria has just been living on her couch for the most part. Thank you Roll A Bout! !